Dr. Michael Roberts, Assistant Professor in the School of Kinesiology and director of the Molecular and Applied Science Lab, and Dr. Jeffrey Martin, Chair and Assistant Professor of Cell Biology and Physiology at the Edward Via College of Osteopathic Medicine (VCOM)-Auburn Campus, are Co-Investigators on a $30,318 research project for NormaTec, a Massachusetts-based company that specializes in Pneumatic Medicine. NormaTec owns a patented compression device that is essentially two inflatable boots that cover the length of the legs and provide compression at various intervals to enhance circulation. 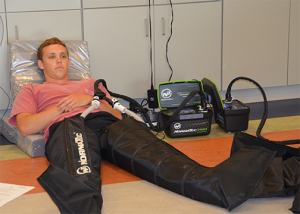 The NormaTec Pneumatic Compression Device (PCD) uses a patented Peristaltic Pulse to provide dynamic compression to limbs compromised by poor circulation. According to NormaTec’s website, NormaTec PCD may be used to treat non-healing wounds, venous insufficiency, lymphedema, sports injuries, and other circulatory and peripheral vascular conditions. The study, entitled “Effects of NormaTec Compression Therapy on Skeletal Muscle Adaptations Following Rigorous Weight Training or Aerobic Exercise,” is Phase II of a previous study. It is scheduled to begin August 1 and conclude around the second week of December. Phase I did not involve exercise with the human subjects, but simply examined gene expression in muscle tissue with no compression, low compression, and higher compression. This second phase incorporates exercise in two groups of 20 human subjects each. One group will undergo one week of intensive weightlifting with or without the NormaTec treatment following each training session. The other will undergo one week of intensive aerobic training with or without the NormaTec treatment following each training session. Markers of muscle damage will be assessed prior to and following the week of training for both groups with skeletal muscle biopsies. Other markers such as muscle function and muscle soreness will also be assessed. Collaborating on the research is Dr. Lee Zhang, Director of the Genomics and Sequencing Laboratory in the Department of Entomology and Plant Pathology. Also assisting with the research are Dr. Roberts’ doctoral students, Wes Kephart and Cody Haun, a new Ph.D student in the School of Kinesiology who came from the Center of Excellence for Sport Science and Coach Education at East Tennessee State University.